At every summer event, no matter how well you plan, I can almost guarantee you will have a few uninvited guests: mosquitoes. Not only are mosquitoes annoying, buzzing around your head looking for a piece of exposed skin to leave the gift of itchy, red bumps, but they also can carry a potentially dangerous virus called West Nile. West Nile Virus first appeared in New York in 1999 and now is a common summertime problem in many states. According to the CDC, in 2011 over 700 people in the United States were infected with West Nile Virus and 43 died as a result of the dangerous (but rare!) neurological complications of the virus. Most people infected have either no symptoms or experience mild symptoms such as fever, headache, body aches or skin rash that often go away on their own. MayoClinic advises people to seek a doctor when they experience symptoms such as stiff neck, high fever, convulsions and pain, which can be signs of a serious neurological infection such as encephalitis, which is swelling of the brain, or meningitis, swelling of the brain tissue and spinal cord, which are both life threatening. 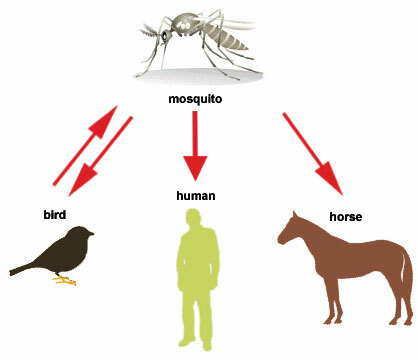 When a mosquito bites an infected animal, usually a bird, that mosquito can become infected with the West Nile virus. So when that mosquito bites you, you can also become infected. The good news is that most mosquitoes don’t carry West Nile so your chances of getting sick are pretty slim. Also, you can’t catch it from someone else like the common cold virus by touching or kissing another person. Since it is impossible to tell if a mosquito is infected with West Nile, it’s best to take precaution, especially if there are West Nile infections in your area. 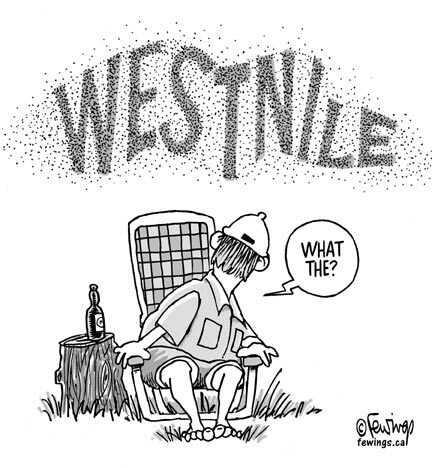 Be sure to check your local news to see if West Nile is making any uninvited appearances nearby. Use insect repellent when you are outdoors. Mosquitoes are most active from dusk to dawn, so if you are going to be outside during that time be sure to wear insect repellant and wear long sleeves and pants. Make sure you don’t have any holes in your window screens. Mosquitoes breed in pools of still water, like water in a bird bath or water sitting in a tire swing. Be sure to empty out water in trash cans, empty pots, buckets, pet dishes and kiddie pools when they are not being used. Your community may also participate in spraying for mosquitoes. Pay attention to your local news on when sprayings occur. Spritz on your bug spray, light up some citronella tiki torches and don’t let mosquito crashers ruin your summer!